Whilst in the bathroom this morning I noticed, through the window, that clematis Carnaby has made its sun-seeking way through the wisteria. 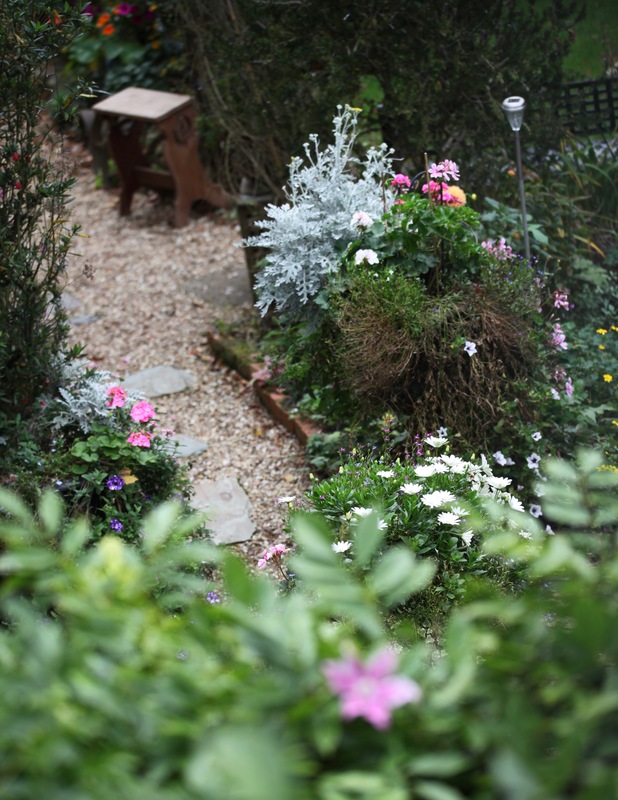 Osteospermum, geraniums, and other flowers still line paths such as this Gazebo one. beyond which the solanum still covers the dead tree. Please note that the Head Gardener has now placed the blue plastic trug underneath the bench. The morning was dull enough, and rain poured down all afternoon. Jackie drove us to Wessex Photo at Ringwood where we selected Becky and Ian’s wedding album from a selection they had brought in for us. the other was of the bride’s bouquet. This evening we dined on Jackie’s splendid special fried rice supplemented by Lidl pork spare ribs. The Culinary Queen drank Hoegaarden, while Elizabeth and I drank Sax Loquuntur Rioja 2015. This entry was posted in Uncategorized by derrickjknight. Bookmark the permalink. Such happy pictures, Derrick. 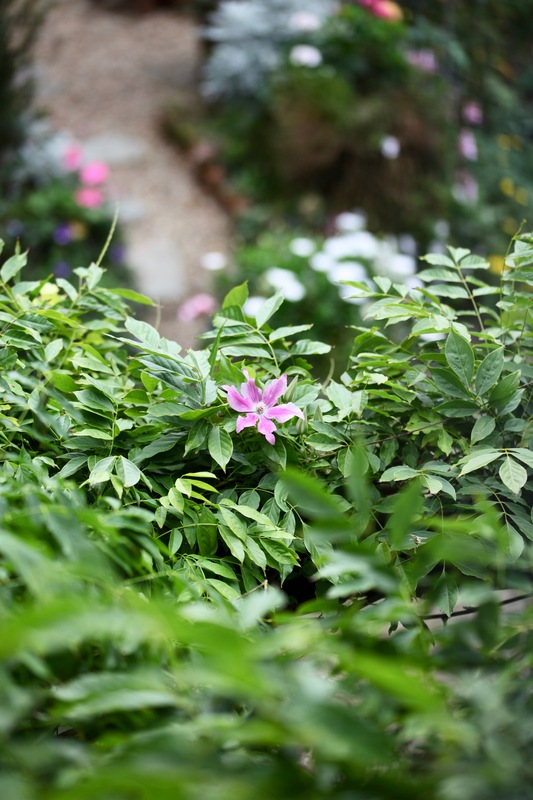 Including the clematis sneaking up through the wisteria! I should have planted a clem next to my wisteria, since the wisteria rarely bloomed. 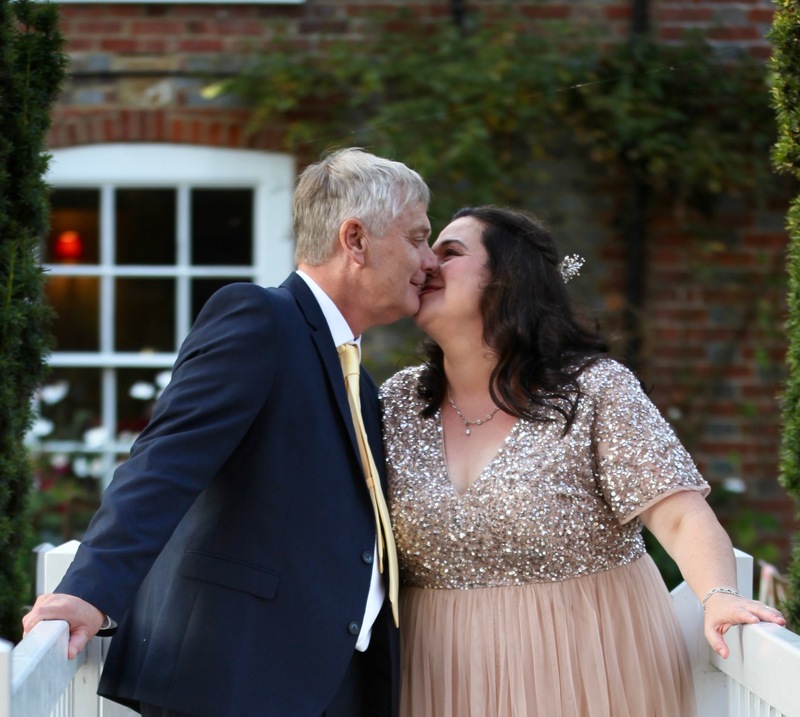 I have to admit I really like Becky’s sparkly sequined bodice on her dress and it suits the gypsophila bouquet flowers perfectly as you captured in your close up. 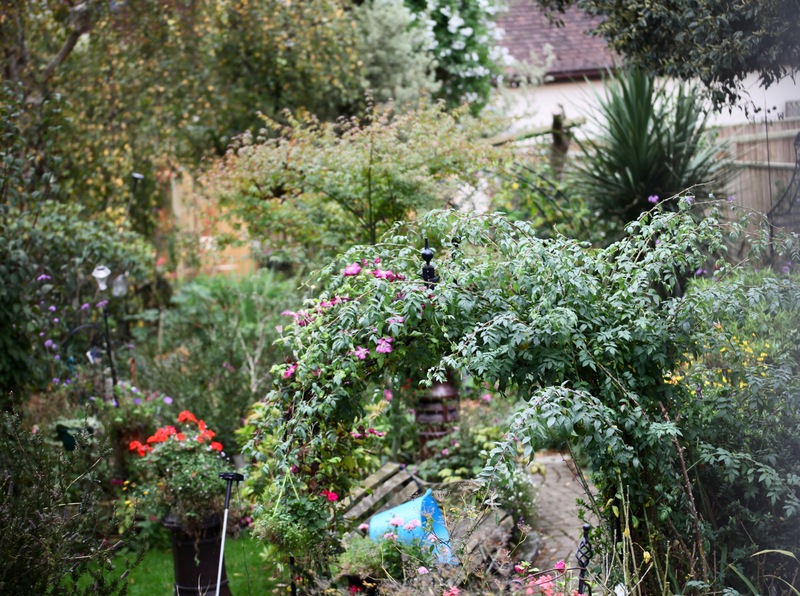 The blue bucket made me laugh out loud as I imagined what the head gardener would have to say about that being photographed 🙂 I love how the garden can be viewed from any room in your house and look amazing! Very many thanks, Pauline 🙂 I wasn’t going all the way back downstairs to move the trug. What a beautiful picture of the happy couple. They’re lucky to have such a talented photographer. Yum! I’ll bet Jackie’s special fried rice is delicious! Funny you should mention the trug, as it caught my eye, although it is a charming feature in its own way! Wow gorgeous dress and bouquet! I enjoy every photographic excursion into your garden, Derrick. The Head Gardener is certainly doing a splendid job! I like the blue plastic trug! Beautiful photos, Derrick! All of them are smile-bringers! You have a lovely view from your bathroom! The blue plastic trug did catch my eye! How wonderful that you found a photo album for the happy couple! Tell The Head Gardener/Culinary Queen that I love seeing the fruits of her loving labors! PS… How is your Mum doing today? I really like your post it looks very nice, Your post is really great and awesome pictures you captured. Thanks for sharing it. Beautiful photos. 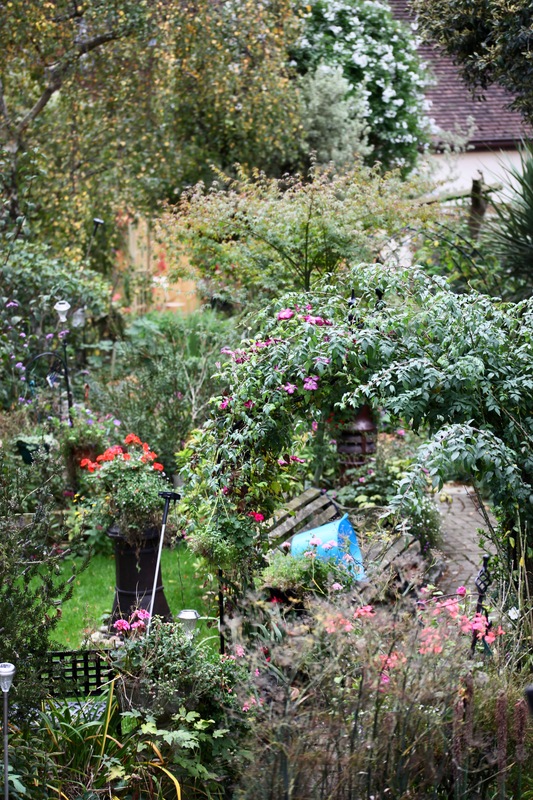 Your garden seems to be beautiful in all seasons. I agree with Pauline’s comments–though I like the blue bucket. I can imagine some Impressionist painter’s garden painting with that little focal detail. Beautiful. And the bride and groom look radiant. 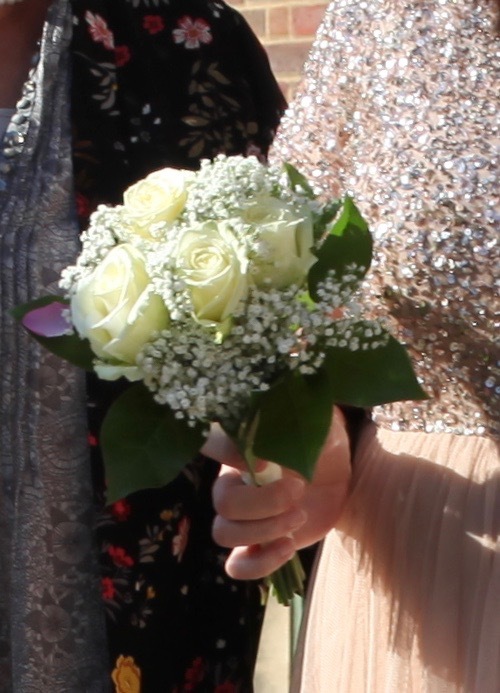 The bouquet appears to be an extension of the bridal dress. Great storytelling shots as ever! Lovely photos as always. I like the natural look in the garden and the simplicity of the bridal bouquet. Ian and Becky look quite enchanting, Derrick through your gifted lens! Quite a happy, beloved photo to keep forever.